Sonne Global Inc. is a worldwide provider of unparalleled products and services for leading brands and renowned companies in North, Central, and South America. As a leading provider of Marketing services, we take pride in offering outstanding Marketing campaigns. Branding services and Licensing programs, including licensed and private label apparel, jewelry, accessories, and general merchandise. Sonne Global also brings renown services in the music and entertainment field with Sonne Records & Entertainment and Sonne Film Studios. Our corporation was founded over a decade ago in South America (Cochabamba - Bolivia) and has become one of the top companies in the industry. As one of the leading marketing companies in South America and with the steady growth in demand of our services, we have expanded internationally and now have various strategic partners throughout the world. 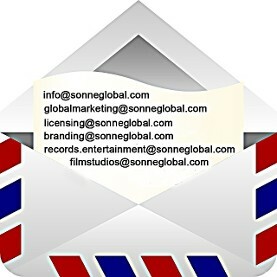 Sonne Global Marketing, Sonne Licensing & Branding, Sonne Records & Entertainment, and Sonne Film Studios now has branch divisions located in the City of Menifee, California. We provide muilt-lingual communications including English, Spanish, and Portuguese. "The word Sonne comes from the German language and means Sun, the Sun is the center of the galaxy".